In northern Vietnam lies this gem of a city where French food and fashion meet Vietnamese culture and vermicelli. Sometimes overlooked as it’s not as big of a hub as Ho Chi Minh City, Hanoi offers a taste of authentic street food and genuinely good prices. 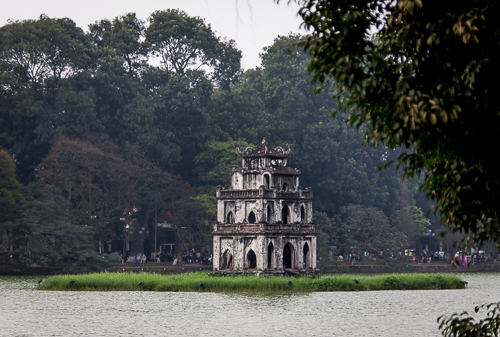 Hanoi has a huge range of hotels on offer from $4 a night for a shared dorm to much, much more at some of the fancier establishments in the French quarter. We’re at a solid $14 USD a night which has a western bathroom/shower and includes breakfast. With only a few minutes walk to the old quarter, we’re at the heart of the city and don’t need to rent scooters or bicycles. For lunch we eat street food, sitting on tiny child-sized plastic stools along the sidewalk: maybe a bowl of phở or a sweet and savory bun cha, each costing somewhere between 30,000 and 50,000 dong. A bowl of fruit salad mixed with coconut cream, tapioca balls, and jelly cubes with crushed ice will only run you about 20,000 dong as a sweet snack to tide you over until dinner. Dinner may set you back you a bit more but can still be done affordably. We often eat phở on the street for 50,000 dong, but there are many restaurants serving western fare as well as Vietnamese and French for a bit more. Household items can be bought from corner shops (we bought electrical tape for 5,000 dong, the equivalent of about $0.25 USD) and shopping for clothing and handicrafts is plentiful but requires a lot of hard bargaining. Beer is the cheapest I’ve ever seen at 20,000 dong or less. Anything that moves is eaten here. A few times we’ve seen the word for dog on the menu and then steered clear. The cuisine of Hanoi is incredible but there might be a few too many options for my tastes. Also spotted were some toads in cages waiting to be sold for food and various crickets on menus. Breakfast at our hotel is a simple crusty baguette and fried eggs with burnt coffee mixed with sweetened condensed milk. We head out for the Cong Cafe, a four-storey coffee house that serves traditional Vietnamese favorites like egg coffee as well as the typical coffee house fare like americanos. Decorated like a Viet Cong bunker hideout, you can enjoy the wifi with an egg coffee while sitting on burlap sack pillows against a bullet-pocked wall. Grab a banh mi sandwich for lunch filled with BBQ pork and pate. After getting some work done, a walk around Hoan Kiem Lake is a great place to people-watch as all the newly married couples head here with photographers for their wedding photos. Dinner at our favorite phở place at 49 Bat Dan Street (we ate here 3 times in one week) is a hectic wait in line that snakes onto the street, but it is ultimately worth it as we watch the owner chop hunks of beef off and drop them into our soup. Perhaps we indulge in a Ha Noi beer during dinner and then head back to the hotel for the night. Amazing street food with unbeatable prices at every turn. The traffic is crazy and crossing the street takes some practice, but once you’ve mastered the confident stride into chaos, you no longer need to wait for a green light to tell you when to cross. Whether or not a shop has what you’re looking for, they will help you find it no matter what, even if it means going to get it from another shop for you or pointing you in the right direction. In just one week we’ll be splitting off: Tony will head back to Canada and I will hop a flight to Bali where I’ll eventually make my way to Gili Trawangan for a couple months. To follow along, head over to Unknown Home and check us out!